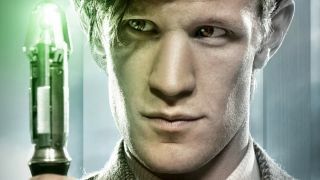 Matt Smith, perhaps most famous in geek culture for playing The Eleventh Doctor on Doctor Who, has been cast in Star Wars 9, according to a report from Variety. Smith is said to play a "key role," but no clues as to who (or what) he could be are given. Admiral Thrawn? A Knight of Ren? Snoke's father? It's all up for grabs. Smith will be starring alongside the usual new trilogy names like Daisy Ridley, Oscar Isaac, and John Boyega, as well as series newcomers like Keri Russell (Mission: Impossible 3), Richard E. Grant (a fellow Doctor Who alum), and Dominic Monaghan (The Lord of the Rings trilogy). If you want to see what Smith has been up to since leaving behind the fez and bowtie, go check out Terminator: Genisys... haha, just kidding, don't do that. But do feel free to check out Netflix's The Crown, where Smith plays Prince Philip. It's quite good! Star Wars 9 has started production, but we still know very little about it. Of course, that's what fan speculation is for, isn't it? Why not check out some of the biggest Star Wars 9 theories and see what you think?